NEW ORLEANS – There’s a new No. 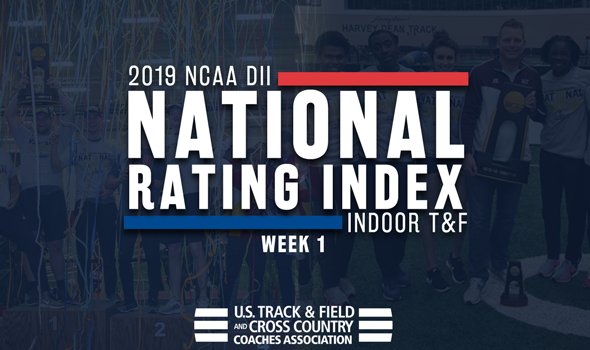 1 on the men’s side while 24 of the top-25 experienced change on the women’s side in the latest edition of the NCAA Division II Indoor Track & Field National Rating Index released by the U.S. Cross Country and Track & Field Coaches Association (USTFCCCA) on Tuesday. The Ashland men took over the top spot on the men’s side for the first time this year while the Grand Valley State women have a strong hold on their side of the ratings, one that saw two top-five teams set new program bests. Ashland is the new No. 1 after it picked up 177.86 points. It has only been a brief time away from the No. 1 rating as the program held the top spot for Weeks 1-7 of last year. The Eagles have gotten strong performances across multiple disciplines to open the year. Myles Pringle is the top rated 400 athlete and is second overall in the high jump. Trevor Bassitt is currently ranked No. 1 in the 60H and No. 3 in the 200 with a time of 21.35 ran just this past weekend. The group also has three weight throwers in the top-five with Brent Fairbanks (first), Alex Hill (second) and Nick Zak (fifth). A deep sprint and throws group propelled the unit to the top spot in the country. Trading spots with Ashland was No. 2 Adams State who opened the year as the favorites to capture the national crown. The Grizzlies received 156.67 points in this edition of the index. The “drop” is through no fault of their own as the Grizzlies have been solid this year through the first two meets. The group is led by Sydney Gidabuday who is picking up right where he left off from the cross country season. Gidabuday is the top rated athlete in both the 3000 and 5000 events. The distance group is strong overall with Elias Gedyon being ranked second in the 3000, Austin Anaya is right behind in third and Miguel Villar is eighth. Ian Kerr is also the No. 5 athlete in the 200 while James Freeman holds the same spot in the mile. The DMR also holds the top time in the nation ran just this past weekend. Holding at No. 3 was Tiffin with 125.92 points. Top performers so far this year include Jonte Baker (second in the nation in the 60), Errik Snell (fifth in the 60H), Cameron Burrows (fifth in the high jump), Toryko Grace (sixth in the weight throw) and Cameron Burrows (eighth in the heptathlon). Throwers Jabari Bennett and Nikolas Curtiss are also ranked No. 2 and 3 in the shot put, respectively. Jumping up three spots into the top-five was No. 4 Findlay with 95.18 points for its best rating since the 2016 preseason. The Oilers have competed in three meets and have been led by national No. 1 triple jumper Martin Etsey and shot putter Eldred Henry. Austin Combs is another main contributor as he is No. 3 in the weight throw and No. 5 in the shot put. Remaining at No. 5 was Grand Valley State after picking up 95.09 points in the index. The Lakers are a well rounded unit with top athletes across sprints, distance and field events. They are currently led by Dennis Mbuta (second in the 800), Zach Panning (second in the 5000) and Enael Woldemichael (third in the 5000). Making up the rest of the top-ten was No. 6 West Texas A&M (79.41 points), No. 7 Lee (Tenn./79.24), No. 8 Angelo State (77.94), No. 9 Central Missouri (75.72) and No. 10 Academy of Art (71.62 points). Angelo State shot up 18 spots while Lee had an improvement of 17 as each one set a new mark for program best. The largest leap in the rating went to No. 29 Mount Olive after a 62-spot improvement from the preseason. There were 16 new teams in total to the rating who were previously unranked during the first index. Twenty-two of the top-25 teams experienced some kind of movement this week. Grand Valley State holds a strong hold over the early season ratings as it came in as the No 1 program for the second consecutive week to open the year with 259.39 points. The Lakers currently own the leaderboard across multiple disciplines as one of the most complete programs in the nation. On the sprints side, Rachael Walters is the No.2 ranked athlete in both the 800 and mile while Nicole Sreenan is third in the 400, sixth in the 200 and seventh in the 60. Abby Crouch is also third in the mile. The distance group is covered with Allie Ludge (second in the 3000), Gina Patterson (third in the 3000), Hanna Groeber (second in the 5000) and Stacey Metzger (fourth in the 5000). They also have the current No. 4 in pole vault (Ellianne Kimes), No. 6 in the long jump (Alexis Duncan) and seventh in the weight throw (Bobbie Goodwin). Oh, and their 4×400 relay current is the No. 3 unit in the country. Slotting in behind them after a one-spot improvement was No. 2 Adams State with 193.37 points as the always strong Grizzlies have quite a squad themselves. The sprints group is led by Dianna Johnson and Kandance Thomas who sit No. 1 and 2 in the country in the 60 at this point. Thomas is also seventh in the 200m while teammate Tiffany Christensen is the top athlete in the mile and 12th in the 800. On the distance side, Kaylee Bogina is fifth in both the 3000 and 5000. Oweneika Watson is also fourth in the 60H and the DMR team is currently tops in the land. Dropping just one spot was No. 3 Lincoln (Mo.) who registered 121.76 points. It wasn’t their doing as the Blue Tigers have the nation’s current best in the 200 (Rene Medley), 400 (Renea Ambersley) and the 4×400. Medley is also fourth in the 60 while Christine Moss is third in the 200 and eighth in the 400. Climbing up seven spots to No. 4 was UC-Colorado Springs after strong performances in its three meets this year. The Mountain Lions have had top performers in Skylyn Wbb (top rated athlete in the 800), Kaija Crowe (top in the pentathlon and third in the long jump) and Hannah Meek (fourth in the long jump and eighth in the triple jump). The rating is a new program best as UC-Colorado Springs has never appeared in the top-five before. After one of the largest improvements in the top-25, No. 5 now belongs to SF State with 91.14 points after a 12-spot improvement from the preseason. The Gators have top performers in Monisha Lewis (top ranked athlete in the 60H), Timarya Baynard (second in the 400) and Alexis Henry (fifth in the 400). The 4×400 relay is also currently second in the nation. It is a new program best for SF State as the school has never been ranked inside the top-25 in its history. Rounding out the top-10 was No. 6 Academy of Art (79.85 points), No. 7 Lewis (78.97), No. 8 Ashland (69.95), No. 9 Pittsburg State (62.41) and No. 10 Indianapolis (62.17). It was the best rating received by Academy of Art since 2013. The biggest improvement in the ratings belonged to No. 53 Winston-Salem State who shot up 55 spots. There were 14 new teams to the rating who were previously unranked during the first index.